Winding up is the process where the business operation of a company is terminated and its assets are realised and the proceeds are paid to the creditors according to priorities. - a special resolution is passed or the court makes an order. 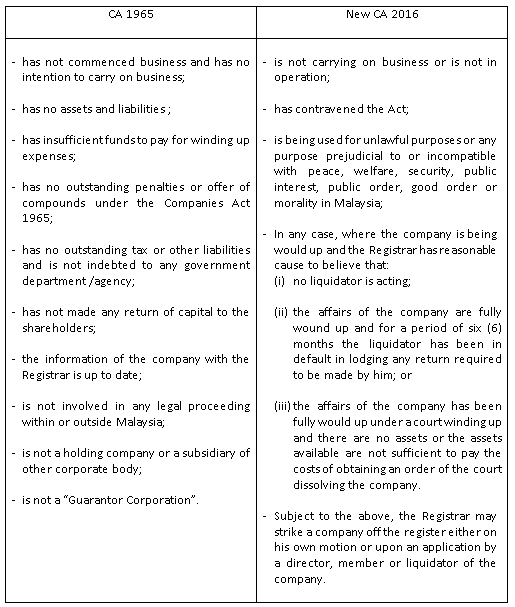 - a liquidator is appointed by the shareholders and/or the creditors or by the court. - the company’s assets and affairs are managed by the liquidator. - the liquidator converts the company’s assets into cash and pays the company’s creditors. - any surplus after payment to creditors is distributed to the company’s members. Winding up is by way of a compulsory winding up by the court or a voluntary winding up by the creditors or members. The creditors of a company may apply to the court to compulsorily wind up the company if it is trading unprofitably or is insolvent. In a members’ voluntary winding up, the company is solvent and a declaration of solvency is made by a majority of the directors. In a creditors’ voluntary winding up, the company is usually insolvent and a director makes a Statutory Declaration that the company cannot continue business because of its liabilities and that meetings with the creditors have been summoned for a date within one month of the date of declaration. The liquidator appointed in a compulsory winding up is a representative of the court. He must be the Official Receiver or an approved company auditor. The liquidator appointed in a voluntary winding up is an agent of the company and is appointed by the company in general meeting. Written consent to act as liquidator is required before appointment. The CA 1965 requires an approved liquidator to be an approved auditor. The new CA allows persons other than auditors who have sufficient experience in insolvency work to apply to the Minister of Finance for a licence to be an approved liquidator. The liquidator’s task is to realise the assets of the company and to ensure an orderly distribution of proceeds arising from realisation to the persons entitled. The liquidator’s powers are vested in him by common law and by statute. - the company’s business will cease. - the management and administrative powers of the directors will cease. - transfer of directors’ powers except for certain statutory duties, to the liquidator. - disposal of company’s property by the liquidator. - employment of staff in a compulsory winding up will be determined. - restrain on initiation of civil process and execution of judgements. - all transfers of shares is void unless approved by the court or liquidator. - inspection of company books and registers restricted. A company may be struck off or deregistered from the register if the Registrar has reasonable cause to believe that the company is not carrying on business or is not in operation. A company shall be dissolved when it is struck off from the register. The liability, if any, of every director, officer and member of the company continues and may be enforced as if the company had not been dissolved. The court has the power to reinstate the name of a struck off company to the register if an application is made by any person aggrieved by the cancellation and the court is satisfied that the company was in operation at the time of striking off. The CA 1965 requires an application to be made within fifteen (15) years after the strike off. The new CA requires an application within seven (7) years.